We are all waiting for the ‘official’ numbers from World Chess. Please, not ‘Alice in Wonderland’ numbers again, Mr. Merenzon! But why should we expect different? The world of chess-organizers, apparently, is a world of bull-shitters and half-liars; sleazy salesmen; promises of 600 million ‘regular’ chess players world wide; or of 23 million ‘members’ at ChessCom; and other inflated sexual fantasies. 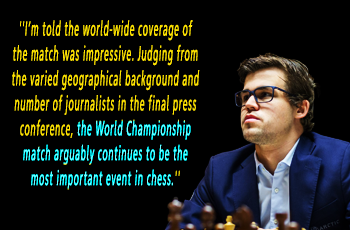 Look at reality: just a week after the Carlsen – Caruana match in London, we are back at square one: the World Rapid and Blitz Championships has no official sponsor (or atleast no name, as of writing this) and is forced to find a reluctant organizer back in mother Russia. It should have been anticipated! Dvorkovich & Co. just sat on their hands. Surely a sponsor (with a name) could have been arranged before now. A city somewhere outside of the usual handful of fall backs could have been found. Or, maybe, FIDE tried all of this….and found out that NO ONE was interested. This I think is the most likely scenario…after all, Dvorkovich is no slacker. IN ANY CASE, now those players who want to participate in St.Petersburg have less than 3 weeks to make arrangements, and worse of all, they have to go to their nearest Russian consulate…and bleed for a visa. 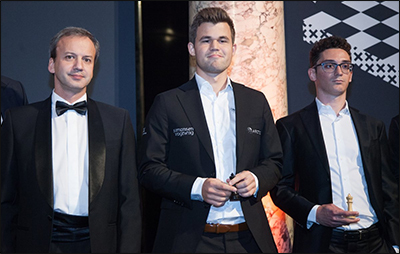 FIDE’s usual way of saying ‘Merry Xmas’ to chess players…the more things change, the more they remain the same! READ Samaganova: 2016 Champ of Kyrgystan!